No one really knows what the Siamese cats of ancient Siam looked like. Siam is now the modern nation of Thailand and by the mid-twentieth century average Thai families did not commonly breed Siamese cats, if they ever did, and the aristocratic Thai families did not commonly breed Siamese cats either (Baker, 1951). There is a book of cat poems that was set down in written form by scribes of Siam many hundreds of years ago. The cat poems contain illustrations of various types of cats (Clutterbuck, 1998). The illustrations show cats of many colors and patterns and may include cats similar to the Siamese, Korat, Burmese, Havana Brown, and Tonkinese cats of today. We cannot tell how they were bred, whether they were each bred separately as is done today or whether they were often bred to each other. We do not know whether the breeders of ancient Siam chose to standardize the body type of the Siamese cats or whether they focussed only on color and pattern, letting body type develop by chance. We do not know to what extent the body types of cats in the illustrations were drawn realistically or were stylized to suit the artist. What we do know is that cats with the pointed pattern and blue eyes of the Siamese could be found in 19th century Siam but were virtually unknown in Europe. We know that the British were the first to become fascinated by Siamese cats in a big way, and they went to Siam to obtain them and import them into England. The earliest documented imports were during the 1870s, but were apparently not used in breeding programs. The British were beginning to hold cat shows and develop standards for breeding pedigreed cats about then. It was not long before Siamese were a small but persistent part of the scene. All pedigreed Siamese cats today are descended from about eleven cats that were imported into England from Siam beginning in the 1880s (Denlinger, 1952). For details about the ancestors of our pedigreed Siamese cats, we have to examine written records, photographs, and eye-witness testimony describing the earliest English Siamese. Photographs of most of the cats did not survive to the present day. The few surviving 19th century photos show relatively robust, round-cheeked cats that in the 20th century became known colloquially as "applehead" Siamese, though their heads were not truly round. There appear to be two distinct types—the compactly built, short in body, short on legs, and round in head; and the long-bodied, long-faced, lithe, sinuous, and peculiarly foreign-looking variety. Ah Choo. This lovely seal point female was born in 1900 and bred by Lady Vyvyan. Of the royals there seem to be two types in England: the one—rather a small, longheaded cat, with glossy, close-lying coat and deep blue eyes, and with a decided tendency to darken with age—is generally the imported cat or having imported parents; the other is a larger cat, with a rounder head, a much thicker, longer, and less close-lying coat, and the eyes a paler blue (these cats do not darken as much or as soon as the other type, and have generally been bred for several generations in England). 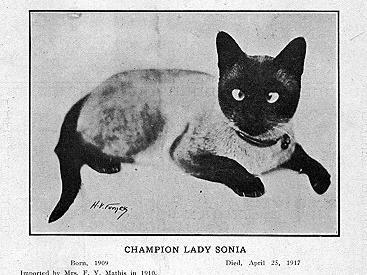 After reading what Mrs. Robinson had to say, we might wonder if the authentic, purebred Siamese cats from Siam were all as slinky and pointed as the show-style Siamese of today. We might wonder if the "applehead" Siamese is strictly a Western phenomenon, the result of hybridization of imported Siamese with the heftier, fluffier native British cats. However, Mrs. Robinson's imported stud, Champion Wankee, was considered a fine example of a Siamese for his time, and he was one of the imported cats that presumably Mrs. Robinson was talking about. He did have a distinct muzzle and a long body. This was not a round-skulled or compact cat. Yet clearly Champion Wankee would be considered an "applehead" by today's standards. See photo directly below. 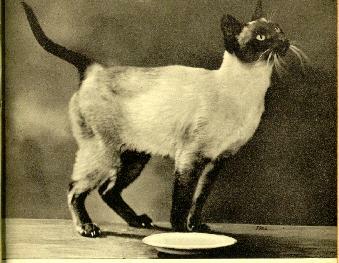 Testimony of other early breeders also indicates that many or most of the earliest imported Siamese were heftier and rounder than the show-style Siamese of today. For example, Mrs. Veley, who owned two of the original imported Siamese, wrote that her imported queen Mia was the rounder, heavier type, and her imported stud Pho was the slimmer, lither type (Franklin, 1995). It is well documented that Pho and Mia were brought back from Siam by Mrs. Veley's brother, the vice consul. 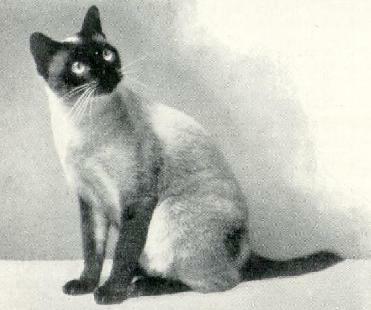 Many authors have also claimed that these cats, both round Mia and slim Pho, were gifts of the king of Siam, but there is no hard evidence to support that, and in fact there is no evidence that any Siamese were ever bred by the king of Siam (Clutterbuck, 1998; Dunnill, 1974; Denlinger, 1952). Returning to Mrs. Veley's allegedly round Siamese Mia and slim Siamese Pho, let's look at their kittens. One surviving photo of Mia's and Pho's kittens shows robust, round-cheeked babies with wedge-shaped muzzles (see below). The appearance of the kittens suggests that Mrs. Veley may have been describing moderate, relative differences in the body types of her cats, not extreme differences. If Pho had been as extremely Oriental in body type as the show-style Siamese of today, we would expect his kittens out of Mia to be at least a little more extreme than the ones you see here. Mrs. Veley was also probably over-generalizing from her own two cats. Most likely the early British Siamese breeders were reading too much into the variation they saw in their tiny population of Siamese breeding cats. Based on what we know now in the 21st century about feline genetics, it is unlikely that there were two distinct types of Siamese. Probably there were varying degrees of variation in body type from Siamese cat to Siamese cat. It appears that most of the early Siamese, perhaps all of them, would have been considered "appleheads" by today's standards. The earliest Western Siamese were on average more moderate and substantial in type than the show-style Siamese of the current era. Incidentally, by doing a little "linechasing" (pedigree research), either on the Web or by conventional means, it's easy to demonstrate that Pho and Mia were among the eleven imported Siamese cats that became the ancestors of all Western pedigreed Siamese alive today. been gifts from the king of Siam. Siamese cats continued to be imported by English breeders into the early 20th century. In the 1910s, Greta Hindley and her husband were living in Malaya, the peninsula that included what is now Malaysia and part of Thailand. When they returned to England in 1919, they brought with them two Siamese cats, including a queen named Puteh. Puteh was the foundation of the famous Prestwick Cattery Siamese. 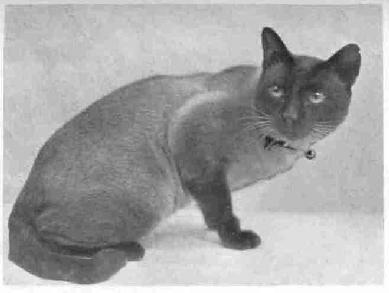 Puteh's daughter, Champion Prestwick Perak, was described by Greta Hindley as having the perfect head shape for a Siamese cat (Franklin, 1995). Photos of Perak and of the other early Prestwick Cattery cats show that although they had wedge-shaped heads and lithe, Oriental bodies, they were still appreciably larger of bone and less extreme than the show-style Siamese of today. (For photos to compare, see for example: Lauder, 1950; Dunnill, 1974; Franklin, 1995). In fact, the majority of surviving early photos of the Siamese cats from the first few generations reveal that they were more robust and had more rounded, wedge-shaped heads than today's show-style Siamese. (See, for example, the photos in Simpson, 1903, and Wade, 1934.) Some early Siamese were rounder and more robust than others, but all were longer of body and wedgier of head than the cobby British Shorthairs and Persians of that time or today. This is probably why the Father of the Cat Fancy, Harrison Weir, wrote a Siamese breed standard in 1892 that described a marten-faced, Oriental type of cat distinctly different from the cobby, round British cats. In short, we do not know what all of the founding cats of the Siamese breed in the West looked like. We have only a limited number of surviving historical photos available to us. But we know for certain that many of the original imported Siamese and their first-generation descendants were moderately wedge-headed, moderately Oriental-style cats of a much more robust, more substantial, rounder, and less extreme type than the modern Siamese. There were many published versions of the Siamese breed standard from the late 19th century to the present. All of those standards could nowadays be interpreted as describing either the Old-Style Siamese or the modern, show-style Siamese because the wording was relative rather than absolute. But a head that was long and marten-faced in 1889 and when compared with the Persians and British domestics of that period, would not be considered long and wedge-shaped by today's 21st century standards and when compared with the much larger range of pedigreed cats bred today. Examine the engraving of the Siamese used to illustrate Harrison Weir's description of the Siamese in 1889 (above). The cat in that engraving was drawn by Weir himself. Harrison Weir, considered today to be the Father of the Cat Fancy, was well known for his knowledge of, and careful observation of, the cats of his time. Weir was also an experienced illustrator. 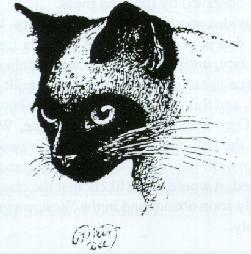 His drawing shows a cat that is not the same as the show-style Siamese of today. It is also noteworthy that Weir described the Siamese wedge as beginning at eye level, at the muzzle, rather than from the ears downward as it does now. He described a marten face, not a marten head. of the original British imports from Siam. Judging from numerous historic photos, the development of the breed to a more extreme Oriental type took place gradually beginning just after World War II. There were no obvious changes in the published breed standard accompanying this trend. In CFA, the major change in the breed standard was actually not in the standard per se but in the preface to the standard that explains how the standard should be interpreted. In 1966, a new preface to the CFA breed standard was written in which the selective breeding of the Siamese was compared to nature's molding of the cheetah (Burns, 1993). Breeders were heralded as artists creating a new work of art. This 1966 preface favored a more extreme type of Siamese. 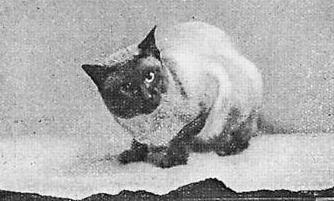 The ultra-Oriental modern Siamese by then was beginning to dominate show circles. It was subsequently bred in ever-increasing numbers and the shift toward a more extreme body type became apparent even in most pet quality Siamese by approximately 1980. Nevertheless, some of the remaining moderate Siamese from the 1960s were preserved and their descendants still exist today. These we call the Old-Style Siamese. Alderton, David. Cats. New York: Dorling Kindersley, Inc., 1992, page 18. Baker, Hettie Gray. 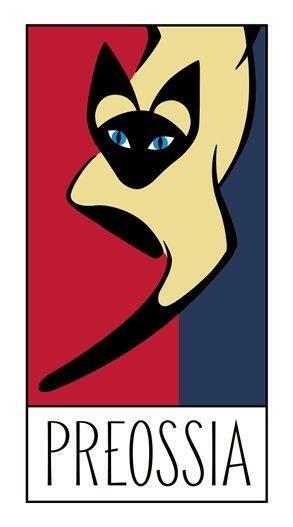 Your Siamese Cat. New York: Farrar, Straus & Young, 1951. Burns, Barbara S. All About Siamese Cats. Neptune City, NJ: TFH Publications, 1993. Clutterbuck, Martin. The Legend of Siamese Cats. Bangkok, Thailand: White Lotus Press, 1998. Denlinger, Milo G. The Complete Siamese Cat. New York: Howell Book House, 1952. Dunnill, Mary. The Siamese Cat Owner's Encyclopedia. New York: Howell Book House, 1974. Franklin, Sally. The Complete Siamese. New York: Howell Book House, 1995. Lauder, Phyllis. Siamese Cats. London: Williams & Norgate, 1950. Naples, Marge. This is the Siamese Cat. Jersey City, NJ: TFH Publications, 1964. Naples, Marge. Siamese Cats. Neptune City, NJ: TFH Publications, 1989. Simpson, Frances. The Book of the Cat. London: Cassell and Company, 1903. Van der Meid, Louise. Siamese Cats. Neptune City, NJ: TFH Publications, 1978. Wade, Phyl. The Siamese Cat. London: Methuen & Company, 1934. For questions about this site, email the Webmaster.